The network-ready Oki MC861cdxn is favoured by offices and companies for its reliability, speed, and excellent output quality. It is capable of printing, copying, scanning, and faxing, plus it comes with built-in Ethernet. The Oki MC861cdxn multifunction colour printer is ideal for work environments with high-volume printing needs as it has high-paper handling capacity and it has a monthly duty cycle of 75,000 sheets. The Oki MC861cdxn laser printer does not have Wi-Fi and the unit itself is quite pricey. The Oki MC861cdxn multifunction printer measures 1130 x 845 x 766 mm and weighs 95 kg. It has a short cabinet and 2 extra trays; the maximum paper handling capacity is 1,460 sheets. The Oki MC861cdxn printer has a flatbed scanner supported by columns; it has a maximum scan resolution of 600 x 600 dpi and scan speed of 34 spm. Ethernet and USB ports are on the back of the unit, another USB socket for flash drives is on the front along with the control panel with touch-screen LCD display. The black Oki MC861cdxn toner has a capacity of 9,500 pages which is only slightly less than the colour cartridges for the MC861cdxn which print approximately 10,000 pages. The Oki MC861cdxn colour laser printer is quite speedy; it has maximum print speeds of 34 ppm for black and white and 26 ppm for coloured. The MC861cdxn colour MFP printer has excellent features including a duplexer and an automatic document feeder. 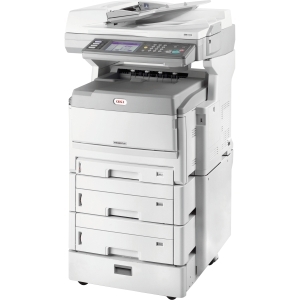 Scan-to-email and USB and PC-fax can be done with the Oki MC861cdxn. The all-in-one Oki MC-861cdxn multifunction printer offers Ethernet for networking and support for Macintosh and Windows operating systems. Expect the Oki MC861cdxn to be quite expensive. Only a limited number of people can use this multifunction printer as it only supports Ethernet networking.